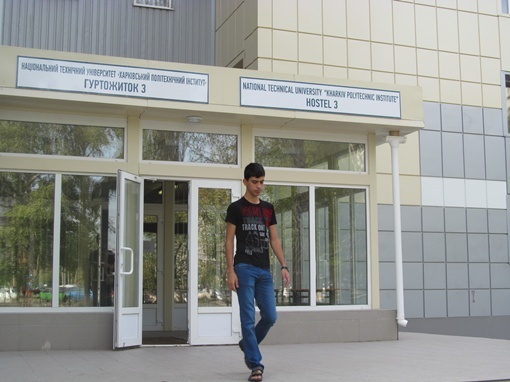 Hostels for foreign students – National Technical University "Kharkiv Polytechnic Institute"
International students live in the following halls of residence of the university. This hall of residence was built in 1971. It is located in the area of “Alekseivskii” complex. The hall of residence for international students belongs to the range of housing with improved living conditions. Nine-storeyed building equipped with two modern elevators. All services, facilities and living rooms are recently renovated. Each room includes a bathroom with toilet and shower. There are two communal kitchens on each floor. There are sports room, rooms for classes and recreation. Video surveillance at the entrance to the hall of residence and on the floors is provided. Students from the Faculty of International Education live in this hall of residence. The participants of UEFA EURO 2012 lived in this hall of residence. Additional kind of services are laundry facilities. This hall of residence was built in 1962. It is the five-storeyed building of corridor’s type. This hall of residence is designed for International students. It is located in the area of “Gigant” complex. There are communal kitchens, toilets and washing rooms on each floor. The bathrooms with shower are situated on the 1st floor. There are also sports room, rooms for classes and recreation. This hall of residence was built in 1955. It is the four-storeyed building of corridor’s type. This hall of residence is designed for international students. It is located in ten minutes’ walk from the university. From 09/01/2017 this hall of residence will be provided as the hall of residence for postgraduate students. This hall of residence was built in 1975. It is the nine-storeyed building of block’s type. It is located in fifteen minutes’ walk from the university and five minutes’ walk from the central park of entertainment of Kharkiv. There are two double and two triple rooms, shower and toilet in each unit. There are two communal kitchens on each floor. The hall of residence for international students belongs to the range of housing with improved living conditions. Nine-storeyed building equipped with two modern elevators. The bathrooms with shower, toilets and kitchens are situated on each floor.